Three physicians offer their thoughts on when and why they consider changing therapy modalities. My first line therapy in just about all patients with center-involved diabetic macular edema (DME) is antiangiogenic therapy. I tend to prefer the medications approved for this indication by the US Food and Drug Administration because there is a wealth of prospective data supporting their safety and efficacy in this indication and an absence of concerns regarding compounding. I use antiangiogenic therapy for a couple of months because these agents are safe locally and systemically, and one can usually tell within the first five to six injections whether the patient will have a good chance of a response. About one in five patients will not respond completely to antiangiogenic therapy, and these are the patients for whom combination therapy may be of benefit. There are a couple of ways I define a patient as failing to respond to therapy. First is the patient whose macula does not dry out after a reasonable term of antiangiogenic therapy. Watching the patient’s anatomy is especially important in the first 5 to 6 months after the inception of therapy because, if the optical coherence tomography (OCT) gets better, the vision usually follows. A second definition of failure is the patient who cannot tolerate an extension between injections after the macula is dry. I explain to all patients that the first year of anti-VEGF therapy has a high treatment burden and monthly injections are often recommended, but I expect most patients will tolerate extension after the first 6 to 12 months of regular therapy. If a phakic patient is not responding, I might try anti-VEGF therapy a little longer; if the patient is pseudophakic I will add the dexamethasone intravitreal implant (Ozurdex, Allergan) earlier for center-involved leakage. If there is a partial response in a part of the central edema but angiographic evidence of a resistant juxtafoveal area I will add deferred laser for leakage in the peripheral macula. In either scenario, if I deem that the patient is not responding to treatment based on the anatomy (ie, change in retinal thickness on OCT or presence of fluid), I may consider a switch to a different anti-VEGF agent after a few months with one drug. However, I am not a proponent of continued monthly antiangiogenic therapy if the patient reaches a plateau of persistent fluid and is not benefitting from ongoing regular treatment. There are some DME patients for whom the dexamethasone intravitreal implant might be first-line therapy, such as those who develop center-involved symptomatic edema and are freshly pseudophakic. These patients have some postoperative surgical inflammation from the cataract surgery and intraocular lens implantation, and angiographically one can often see optic nerve head hyperfluorescence and leakage. A third important definition of a treatment failure is a patient who cannot or will not follow up regularly for the first couple of anti-VEGF injections. This is an equally important definition of treatment failure, and these patients require a good deal of education. I tell all patients up front that, if they are able to attend a year of regular follow-up and frequent injections, anti-VEGF therapy can usually provide good vision and controlled disease. Some patients, however, are unable to comply with this regimen of medical therapy. These patients might be good candidates for the dexamethasone intravitreal implant sooner than other, more injection-compliant patients. David Eichenbaum, MD, is with Retina Vitreous Associates of Florida, in Tampa Bay, and is a clinical assistant professor of ophthalmology at the University of South Florida. He is a consultant to Allergan Inc. Dr. Eichenbaum may be reached at deichenbaum@retinavitreous.com. 1. Ip MS, Domalpally A, Hopkins JJ, et al. Long-term effects of ranibizumab on diabetic retinopathy severity and progression. Arch Ophthalmol. 2012;130(9):1145-1152. Lack of anatomic improvement; ie, persistent edema despite monthly injections. Inability to maintain a dry retina when therapy intervals are extended. There are two scenarios in which a patient’s lack of anatomic response to a therapy will lead me to change modalities. The first is when a patient simply does not respond to one class of medications, such as anti-VEGF therapy, early on in therapy. Typically, if I see no improvement after one or two injections, or less than 20% improvement in macular edema on OCT after three or four injections, then I consider a wholesale switch to steroids. The thought process with these patients is that the DME may be mediated more by inflammation than VEGF. The second scenario in the category of “no anatomic response” includes patients who have undergone multiple injections with a single agent over a year or more and then begin to slip, with earlier recurrence of edema or fluid. In other words, the interval between needed interventions begins to regress, or the edema swells up at shorter time intervals. In this scenario, I often try to switch the patient to another medication in the same class to see if I can get him or her back to the previous state. There are patients in whom it seems impossible to extend the interdose interval with a dry retina. Often this occurs in patients undergoing monthly anti-VEGF therapy. My protocol here is to switch the patient to another anti-VEGF agent. Given the recent results of the DRCR.net Protocol T study, that switch is often to aflibercept.1 The 1-year results showed superior efficacy with aflibercept in visual acuity and anatomic improvements with one fewer injection. My general impression, derived from experience in switching patients from one anti-VEGF agent to another, is that aflibercept lasts about 2 weeks longer than the other agents. The third reason for considering a switch is nonmedical, and this can include insurance “demands” and the rare patient request or preference for one medication over another. Overall, visual acuity is not a factor in my choice to switch patients from one therapy to another, whether in the same class or across classes. Any loss of visual acuity prompts an evaluation of the patient to determine the cause. All too often, other factors such as ocular surface disease, rushed Snellen testing, or lack of proper refraction play a greater role in acuity measurements than actual macular disease. In other words, change in visual acuity may be a sort of “false positive” and prone to subjective error. Objective measurements such as OCT are much more reliable in my experience. John W. Kitchens, MD, is a partner with Retina Associates of Kentucky in Lexington and is a member of the Retina Today editorial board. Dr. Kitchens may be reached at jkitchens@gmail.com. My typical first line approach in patients with diabetic macular edema (DME) is to use anti-VEGF monotherapy for several months (usually 3 to 6 months). After the loading period, I follow a treat-and-extend (TAE) regimen if the macula has dried out. In the ideal scenario, the interdose interval will continue to be extended while maintaining a dry macula. At the end of that initial trial period, the presence or absence of excess fluid in the macula will drive my future management choices. If the therapy has not been able to adequately dry out the macula, I continue monthly therapy. If after a certain amount of time there is still edema, then I consider changing therapy within the same class of drugs. On the other hand, if a patient is on a TAE regimen but is not getting the anatomic and visual outcomes that are possible (in terms of either improved edema or lengthening the interdose interval), I will consider adding or switching therapy. In the past, I have tried switching between anti-VEGF agents, but I have not had much success with this strategy. Therefore, I think more so about adding or switching to the dexamethasone intravitreal implant (Ozurdex, Allergan) in these patients. Now that it is available, I will also consider the fluocinolone acetonide intravitreal implant 0.19 mg (Iluvien, Alimera Sciences) for some patients as a third line therapy if they meet certain criteria. For me, the ideal patient for the fluocinolone intravitreal implant 0.19 mg would be a known steroid nonresponder (as per the label) whose optic nerve looks reasonably healthy and who does not have a lot of other risk factors for intraocular pressure (IOP)–related damage. The fluocinolone intravitreal implant 0.19 mg is a prolonged therapy modality, and there was an appreciable risk of IOP elevation in the pivotal clinical trials, including a 5% rate of incisional glaucoma surgery.1 That said, I have not used this implant yet in my practice, so I do not have personal experience to draw on. I do not give corticosteroids as a first line therapy for DME, either as monotherapy or in combination with anti-VEGF agents initially. It is hard to argue with the results of anti-VEGF monotherapy for DME, especially in light of recently published data such as the DRCR.net’s Protocol T study.2 In addition, there are some downsides to using corticosteroids. However, if I have already moved a patient to the dexamethasone implant and he or she is having a recurrence of edema, then I will likely add anti-VEGF therapy back in. Above and beyond the rationale discussed here, there are some patients who simply do not respond to anti-VEGF monotherapy, although this number is probably well under 5% of patients. The dexamethasone implant is beneficial in these patients, and an early addition of dexamethasone implant to the anti-VEGF regimen will help preserve their vision. Andrew A. Moshfeghi, MD, MBA, is director of the clinical trials unit and an associate professor or ophthalmology at the Keck School of Medicine, University of Southern California. Dr. Moshfeghi may be reached at +1-323-865-6933 or andrew.moshfeghi@usc.edu. 1. Campochiaro PA, Brown DM, Pearson A, et al; FAME Study Group. Long-term benefit of sustained-delivery fluocinolone acetonide vitreous inserts for diabetic macular edema. Ophthalmology. 2011;118(4):626-635. 2. Wells JA, Glassman AR, Ayala AR, et al. 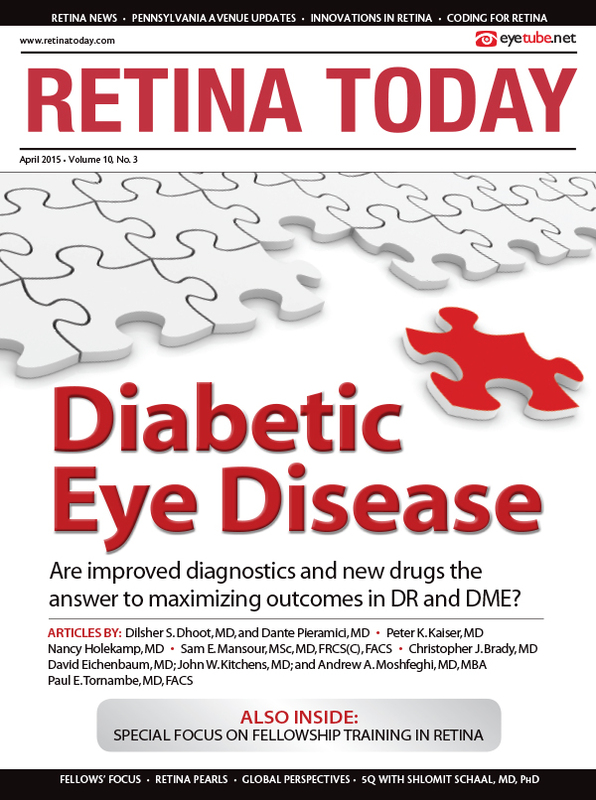 Aflibercept, bevacizumab, or ranibizumab for diabetic macular edema [published online ahead of print February 18, 2015]. N Engl J Med. doi:10.1056/NEJMoa1414264.